The British ambassador in Berlin has been called in to Germany's foreign ministry to respond to spying allegations. The UK's Independent newspaper says the British embassy in Berlin may house a "top-secret listening post". 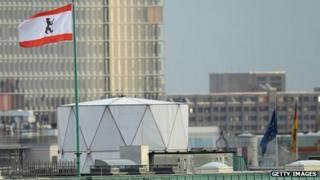 It cites leaked US National Security Agency (NSA) documents suggesting the UK could be using hi-tech equipment housed on the embassy roof. Any such activity would be against international law, Berlin says. A spokesman for David Cameron said the prime minister had not spoken to Chancellor Angela Merkel about the spying allegations and there were no plans for a conversation, although their relationship was "excellent". He refused to comment on security issues but said Britain's intelligence services operated under a "strong and clear legal framework". India now a 'Big Brother' state? German Foreign Minister Guido Westerwelle had requested the attendance of UK ambassador Simon McDonald to respond to the claims, a ministry spokesman said. "The head of the European department asked for a response to current reports in the British media, and pointed out that the interception of communications from the premises of a diplomatic mission would be behaviour contrary to international law," he said. The Independent report, published on Tuesday, was based on NSA documents leaked by US whistleblower Edward Snowden. The report said the NSA documents, in conjunction with aerial photographs and information about past spying activities in Germany, suggest that Britain is operating a covert listening station close to the Bundestag, Germany's parliament, and Chancellor Angela Merkel's offices. Aerial photographs of the embassy in Berlin show a white, tent-like structure, which the newspaper says has been in place since the embassy was opened in 2000. Equipment within the unit "would be capable of intercepting mobile phone calls, wi-fi data and long-distance communications across the German capital," the Independent reported. It follows revelations that the US has listened to mobile phone calls made by Mrs Merkel since 2002. The row has led to a serious diplomatic crisis between the two countries.